Individuals who work from home may be eligible to take a tax deduction for a portion of their housing expenses. A home office is a part of the home that is used exclusively on a regular basis for business. This could be a dedicated room or part of a room or a separate structure. The home office deduction is calculated based on the percentage of the work area to the total area of the home. Eligibility to deduct home office expenses differs depending on whether the taxpayer is a self-employed person or an employee. In both cases, the home office must be used regularly and exclusively for business purposes. Self-employed persons can deduct their home office expenses against their self-employment income, thereby reducing their income tax and self-employment tax. Employees who work from home can take the home office deduction if working from home is for the convenience of their employer. Employees deduct their home office as a part of the employee business expense deduction, which can potentially reduce income taxes. In addition, employees have a fourth criterion to meet: the exclusive business use of the home office must be for the convenience of the employer (Internal Revenue Code section 280A(c)) and not "merely appropriate and helpful" (Publication 587). 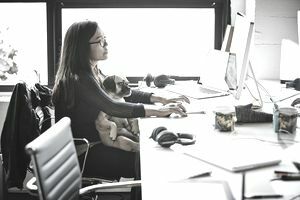 While working from home may be appropriate and helpful for the employee, working from home must be for the employer's convenience in order to be tax-deductible. "Telecommuters who are required to work at home satisfy the employer convenience test," observes the editors of J.K. Lasser's Your Income Tax (pages 410-411, 2013 edition), "but if an employee requests telecommuting and the employer has on-premises office space available, the IRS is likely to argue, barring unusual facts, that the home office is for the employee's convenience and not for the employer's convenience. The IRS has not provided specific guidelines for telecommuters." "To qualify under the exclusive use test, you must use a specific area of your home only for your trade or business. The area used for business can be a room or other separately identifiable space. The space does not need to be marked off by a permanent partition. "You do not meet the requirements of the exclusive use test if you use the area in question both for business and for personal purposes." "You sell products at wholesale or retail as your trade or business. "You keep the inventory or product samples in your home for use in your trade or business. "Your home is the only fixed location of your trade or business. "You use the storage space on a regular basis. "[A]uction and consignment sellers may compute their deduction to the extent of expenses allocable to space in the residence that is used on a regular basis (does not have to be exclusive) to store inventory and/or product samples if the residence is the sole fixed location of the retail or wholesale auction or consignment business." "Your home is the only fixed location of your business of selling mechanics' tools at retail. You regularly use half of your basement for storage of inventory and product samples. You sometimes use the area for personal purposes. The expenses for the storage space are deductible even though you do not use this part of your basement exclusively for business." If a person runs a daycare service out of their home, the area used for daycare might also be used after work for personal use. To accommodate this situation, daycare service providers are allowed to deduct home office expenses even if the area isn't used exclusively for business. "If you use space in your home on a regular basis for providing daycare, you may be able to claim a deduction for that part of your home even if you use the same space for nonbusiness purposes. To qualify for this exception to the exclusive use rule, you must meet both of the following requirements. "You must be in the trade or business of providing daycare for children, persons age 65 or older, or persons who are physically or mentally unable to care for themselves. Daycare service providers calculate their business use percentage for the home office deduction on Form 8829, lines 4 through 7. Regular use means that the home office area is used consistently for business purposes, rather than sporadically or occasionally. For self-employed persons, the home office deduction reduces net business income subject to the income tax and the self-employment tax. Thus, the home office deduction helps to reduce both the income tax and the self-employment tax. For employees, the home office deduction is taken as part of the miscellaneous itemized deduction for employee business expenses. Total miscellaneous deductions (which includes any home office expenses) are reduced by 2% of a person's adjusted gross income. The remainder, after being reduced by 2% of AGI, is what is included as an itemized deduction. Miscellaneous deductions are adjusted out by the alternative minimum tax (AMT), however. So employees who are subject to AMT will find they receive little or no benefit from deducting home office and other work-related expenses. Employees who work from home may want to consider seeking reimbursement from their employer for the business-use portion of their home. As long as the employer reimburses the employee for home office expenses under an accountable plan, the employee will receive tax-free reimbursement of their home office expenses and the employer will take a deduction for the home office expenses. In this situation, the employee would not deduct home office expenses on their tax return, because the expense was already reimbursed. Reimbursements thus avoid the 2% of adjusted gross income limitation on the home office deduction and avoid the AMT adjustment. Imagine that Teresa is an outside sales person, and her employer does not provide her with any office space. Teresa is required to work from home when she's not traveling to meet with customers. Teresa uses 12% of her home as an office, which she uses regularly (five days a week, when not traveling) and exclusively (the room is not used for personal activities). Teresa's wages are $50,000 and she has no other income and no adjustments to income. Teresa's rent is $2,000 per month, and she has no other home office expenses. Let's see how her home office deduction is calculated, and what the tax impacts would be. Home office deduction: 12% x $24,000 annual rent = $2,880. Now let's see what the tax impacts would be for Teresa. First, we'd have to analyze whether it's beneficial for Teresa to itemize or take the standard deduction. Based on the information presented, we don't know. Is the total of all of Teresa's itemized deductions, including the deductible portion of her miscellaneous deductions, greater than her standard deduction for the year? Or is she required to itemize? If so, itemizing would produce better tax results than taking the standard deduction. What would be the tax impact if she itemizes? Based on what we know about her finances, Teresa is probably in the 25% tax bracket (using the 2014 tax rates). Teresa's home office deduction of $1,880 (after the 2% of AGI threshold) would reduce her federal income tax by 1,880 x 25% = $470. Alternatively, Teresa could seek reimbursement from her employer. If her employer reimbursed Teresa $2,880 for the business use of her home, that $2,880 would be tax-free to Teresa. She would not be eligible to deduct the same home office expenses again as a miscellaneous itemized deduction. In this specific example, Teresa could either take the home office deduction and reduce her federal income tax by $470 or she could receive $2,880 in tax-free reimbursements from her employer. Home office expenses are grouped into direct and indirect expenses. A direct expense is a cost solely related to the home office and can be deducted in full. "Direct expenses benefit only the business part of your home. They include painting or repairs made to the specific area or rooms used for business" (Instructions for Form 8829). Indirect expenses are expenses which apply to the whole property. "Indirect expenses are for keeping up and running your entire home. They benefit both the business and personal parts of your home" (Instructions for Form 8829). Indirect expenses such as rent, insurance, and utilities are deductible based on the business use percentage of the home office. "To find the business percentage, compare the size of the part of your home that you use for business to your whole house. Use the resulting percentage to figure the business part of the expenses for operating your entire home. "You can use any reasonable method to determine the business percentage. The following are two commonly used methods for figuring the percentage. "Divide the area (length multiplied by the width) used for business by the total area of your home. "If the rooms in your home are all about the same size, you can divide the number of rooms used for business by the total number of rooms in your home" (Publication 587). Suppose Tom uses his second bedroom regularly and exclusively as an office, and that room measures 10 feet by 15 feet (150 square feet). Tom's whole house measures 1,250 square feet. Tom's business-use percentage is 150 divided by 1,250, which equals 12%. If Tom meets the qualifications listed above, Tom would be able to deduct 12% of indirect home office-related expenses (such as rent, renter's insurance, and utilities). In addition, Tom could deduct 100% of any direct home office-related expenses (such as repairing the drywall in the home office or repainting the office area). The home office deduction is limited to a person's tentative net income from the trade or business to which the home office is related. Tentative net income is the gross income from the trade or business minus deductible expenses other than the home office deduction. Any home office deductions over this limit are carried forward to the subsequent tax year. In other words, the home office can reduce the net income of a business at most to zero, but not less than zero. The home office deduction cannot be used to create a loss or to increase a loss. "If your gross income from the business use of your home equals or exceeds your total business expenses (including depreciation), you can deduct all your business expenses related to the use of your home. "If your gross income from the business use of your home is less than your total business expenses, your deduction for certain expenses for the business use of your home is limited. "Your deduction of otherwise nondeductible expenses, such as insurance, utilities, and depreciation (with depreciation taken last), that are allocable to the business, is limited to the gross income from the business use of your home minus the sum of the following. "The business expenses that relate to the business activity in the home (for example, business phone, supplies, and depreciation on equipment), but not to the use of the home itself" (Publication 587). To calculate the home office deduction, you'll need to know what your expenses are for the home office, whether those expenses are directly or indirectly related to the home office, the business use percentage of the home office, and the limitation on the maximum amount of the home office deduction. If the space is used as a home office for only part of the year, be sure to use only expenses for the period of time when the space was used as a home office in calculating your deduction. Homeowners will need to prorate their deductions between Schedule A and the home office deduction. This applies to deductible expenses for mortgage interest, property tax, and casualty losses. For details, see the Instructions for Form 8829, Lines 9, 10, and 11, from the IRS. Self-employed persons filing Schedule C calculate their home office deduction, and any limitation on the deduction, using Form 8829 (pdf). Self-employed farmers, self-employed business partners, and employees calculate their home office deduction and any limitation on the deduction using the"Worksheet to Figure the Deduction for Business Use of Your Home" found in Publication 587 (pdf). Starting with the year 2013, the IRS permits the use of a simplified method for calculating the home office deduction. Under the simplified method, the home office deduction is calculated at $5 per square foot multiplied by the area of the home office, up to 300 square feet. The simplified method is limited to "$1,500 per year based on $5 a square foot for up to 300 square feet," the IRS said (IR-2013-5). Documents showing that the home office area is used regularly and exclusively for business purposes.